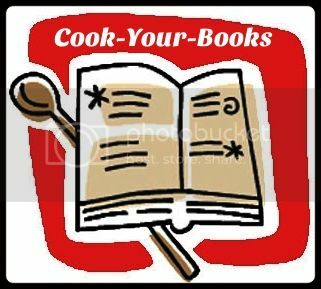 "IHCC October Potluck", the theme for this week at I Heart Cooking Clubs (IHCC). For our potluck week, we are free to cook from any of IHCC's past and present featured chefs. I've decided to cook with Ellie Krieger, the current chef featured at IHCC. I've made Cincinnati Chicken Chili, though originally, the recipe is called Cincinnati Turkey Chili, as ground turkey is used. Turkey is not easily available in the area where I live, so I have replaced with ground chicken instead. Looking at the rather long list of ingredients, I was happy to note that I have everything listed, well, except for the bell pepper. A short drive to the nearby supermarket took care of that! Even though there are so many ingredients on the list, the preparation time takes only minutes with the sauteing of the onions, chicken and spices which takes about 10 to 15 minutes, and the rest of the time is just simmering on the stove. Recipe indicates a long simmering about 2 hours, but I have simmered only about 1 hour 15 minutes, and have added a little water towards the end of cooking time as the chili was getting quite thick. The chili is served over spaghetti, with some diced red onions sprinkled over, which I find really nice with the chili, and added more diced red onions on my plate! The chili is very tasty and I wish that I had some tortilla chips to go with it! Heat the oil in a large Dutch oven or soup pot over a medium-high heat. Add the chopped onion and cook, stirring, until softened, about 5 minutes. Add the garlic and cook for 30 seconds. Add the turkey and cook, breaking it up with a wooden spoon into small pieces, until just cooked through and no longer pink, about 5 minutes. Add the bell peppers and cook until they begin to soften, about 2 minutes. Add the chilli powder, cocoa, paprika, cumin, oregano, cinnamon, allspice, cayenne pepper, salt, black pepper, and cloves and cook, stirring, until fragrant, about 1 minute. Add the tomato sauce, tomatoes with their juice, water, molasses, and bay leaf and bring to a boil. Reduce the heat to low and simmer until the mixture has thickened considerably but is still soupy, about 2 hours. Remove the bay leaf. Serve over the spaghetti, topped with the kidney beans, cheese, and diced red onion. This week's baking assignment at Tuesdays With Dorie (TWD) is Apple Pielettes from Dorie Greenspan's fabulous book "Baking Chez Moi". I have missed a few weeks of baking with the group, and have not been baking much lately either. Hopefully, that will change! Freshly baked Apple Pielettes. Smells wonderful while baking. For the galette dough : I've reduced a tablespoon of sugar for a double-recipe. I've used dark raisins soaked in 2 tablespoons of rum overnight. The raisins absorbed every drop of the rum by the next day. Instead of apply jelly or marmalade, I've used 2 tablespoons Rhubarb-Ginger soft set jam. Omitted the grated nutmeg for the filling. Used a smaller size muffin pan, not the regular standard-sized ones. The cookie cutters I used to cut out the pastry dough are : 3-1/2 " for the base and 2-1/2" for the top, which fits the muffin pan perfectly. The baked pielettes came out of the muffin pans easily. Except for one which has the juice bubbling up through the slits at the top of the pielettes and flowed onto the pan. It was stuck and fall apart when I tried to take it out, but I did enjoyed it straight from the muffin pan with a spoon! Yummy! The rest came off pretty easy. These are so, so, good! 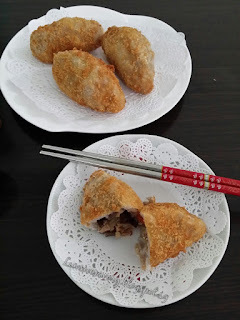 The crust is so tender crisp, and buttery. I like the filling, not too sweet, with all the right balance of flavours from the apples, raisins, dried apricots, vanilla, cinnamon, and I'm so glad I've used the Rhubard-Ginger jam, they are a wonderful addition to the filling. These pielettes are perfect for breakfast, tea-time or just a snack with a cup of tea anytime of the day. 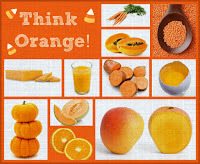 "Think Orange", the theme for this week at I Heart Cooking Clubs (IHCC). We are celebrating the colour orange, and we can make any recipe with any orange-hued ingredients using any of Ellie Krieger's recipes. I've chosen to cook salmon. Simple, easy and quick! Recipe calls for the salmon skin to be removed, but I did not do that. We like eating the fish with skin.The salmon fillets are brushed with some oil, then rubbed with the spice mix ; light brown sugar, chilli powder, cumin powder, ground black pepper, and salt. They are then grilled over medium heat until charred and cooked to your liking. We like ours well-done. Served the salmon fillets with some steamed Asia greens. I did not have any lemons but have lots of calamansi lime. Squeeze half a calamansi lime over the salmon fillet just before serving, yummy! Coat your grill or a grill pan with cooking spray and preheat over medium heat. While the grill is heating, combine the brown sugar, chilli powder, cumin, salt, and pepper. Brush each salmon fillet with 1/2 teaspoon of the spice mixture. Grill the salmon, flesh side down, until charred, 4 to 5 minutes. Flip the salmon and cook for another 5 to 6 minutes for medium doneness. For well-done fish, cook an additional 1 to 2 minutes. Transfer to a platter and serve immediately. 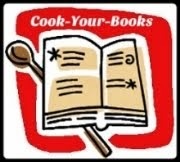 "Monthly Featured Chef Event : Nigella Lawson", our new monthly theme at I Heart Cooking Clubs (IHCC). I like this new theme where once a month, IHCC will revisit one of the past featured chefs, and this month's Monthly Featured Chef, is Nigella Lawson. I've made Nigella's Breakfast Bars, which I have been meaning to make for the longest time! These bars are really super easy to make, but the baking takes about an hour, which is not a problem anyway! Breakfast Bars.... it's an Anytime-for-Snacking Bars for me! Condensed milk is first warmed over a low heat, then mix with all the other ingredients ; rolled oats, flaked coconut, dried cranberries, pumpkin seeds, sunflower seeds, sesame seeds, lightly toasted peanuts. Tip everything into the prepared pan, press down firmly, level it and bake for about an hour at 250F until golden brown. 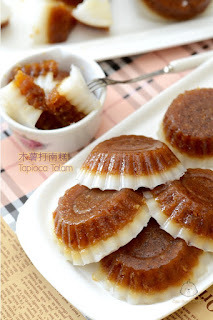 The only sweetener here is the condensed milk, and the sweetness turns out to be just right for me, not too sweet. The baking pan is greased with oil or simply use a disaposable baking foil pan. If you chose to use a normal baking pan, I would advise about greasing it really well with oil. The bars are a little difficult to come out of the pan. Some parts would stick to the pan, but with a little gentle force using the metal spatula, I did manage to take them all out. Preheat the oven to 250F and oil a 9 x 13-inch baking pan or just use a disposable aluminium foil one. Meanwhile, mix all the other ingredients together and add the warmed condensed milk, using a rubber spatula to fold and distribute. Spread the mixture into the oiled or foil pan and press down with a spatula or, better still, your hands (wearing those disposable latex gloves to stop you from sticking) to make the surface even. Bake for 1 hour, remove, and after about 15 minutes, cut into four across and four down to make 16 chunky bars. Let cool completely. Little Thumbs Up (October 2015 : Coconut) organised by Zoe of Bake for Happy Kids and Doreen of My Little Favourite DIY, and hosted by Jess from Bakericious. 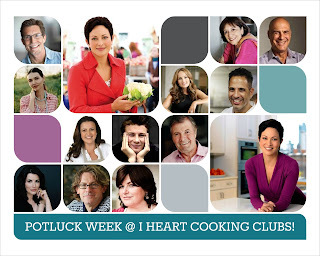 I Heart Cooking Clubs (IHCC) is welcoming a new chef this week, Ellie Krieger. I am rather excited and looking forward to cook from her recipes for the next six months. She is a certified nutritionist and dietitian, with 5 books to her name. And I already have three of her books (yipee!! ); So Easy, Comfort Food Fix, and The Food You Crave. I am really looking forward to cook her healthy meets delicious dishes! 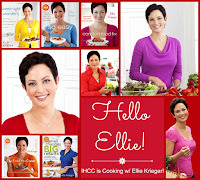 To welcome Ellie Krieger to IHCC, this week's theme is "Hello, Ellie". We can cook any recipe of Ellie's, to welcome her into our kitchen. As usual, for each IHCC's new featured chef, I would explore the chosen chef's chicken recipes first. 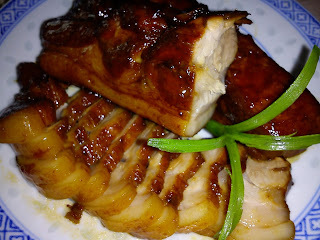 Ellie Krieger has lots of chicken recipes and they look really delicious, can't make up my mind which to make! So for a start, I've made her Honey-Crisp Oven-Fried Chicken, which I've been wanting to make for ages. I knew that this would be a hit with the family. Who doesn't love "fried' chicken! There's no frying involved, but the chicken is baked in the oven until crispy, a healthier option if you are craving for fried chicken. I've used 6 whole chicken legs, which I've chop into two pieces each, separating the drumsticks and the thigh. Discard the skin (Ellie's recipes are all about a healthier diet!). The chicken pieces is soaked in lowfat buttermilk, refrigerated for a few hours. I do not have any buttermilk but I've used whole milk (not lowfat!! ), mixed with a tablespoon or so of lemon juice. For the cornflakes coating, I've used Kellogs, Since I'm cooking more chicken than the recipe calls for, I've doubled the cornflakes, used about 8 cups. After processing in the food processor, they yield about 2-3/4 cups of cornflake crumbs. The crumbs are mixed with paprika, cayenne powder, salt, garlic powder and ground black pepper. I tested on the seasoning by tasting a pinch of the seasoned crumbs, adjust on the seasoning if needed. I added a pinch more of salt to mine. Prepare the baking sheet by spraying it with some oil. Preheat the oven to 350F. When the chicken is done marinating in the buttermilk mixture for a few hours, remove the chicken pieces and discard the buttermilk. Each chicken piece is then brushed with some honey on both sides. Dip the chicken into a plate of the cornflake crumbs, pressing hard so that the cornflake crumbs adhere to the chicken. Place the chicken pieces onto the baking tray and spray lightly with oil on each piece. Bake until cooked, golden and crispy. I've used two baking sheet as I could not fit them all in one. I rotate the two trays every 15 minutes, and the chicken was done in 1 hour 15 minutes. Can you see how crispy it is! Just as Ellie Krieger says "Glazed with honey, coated in crushed cornflakes, then baked to crisp golden perfection - this is your fried chicken craving satisfied." Baked, not fried! No oily stove, no greasy mess, and no extra oil to discard! Thumbs up! This is so good! Chicken is so moist and tender, thanks to the buttermilk. The cornflake crust is so crispy, very tasty with the spices. A total winner in my house! I served the delicious golden crispy chicken with some salad leaves and one of Ellie's potato salad on the side. The potato salad is similar to what I usually make at home. I've used some yellow potatoes which I've peeled and then steam. Ellie's recipe uses peas, which my kids are not fond of. I have omitted that and have added two pieces of pickled gherkins which I've chopped to small pieces. I've always added pickled gherkins to potato salads, we love it! There's hard-boiled eggs too in the salad. Recipe says to cook 4 hard-boiled eggs, use 4 of the whites and 2 yolks, discarding the other 2 yolks. I have however cooked and used 3 hard-boiled eggs, both the whites and the yolks, no need to discard anything! For the creamy dressing, I did not have any Greek yoghurt at hand, so I've used my homemade yoghurt. The creamy dressing is made by mixing yoghurt, mayonnaise, Dijon mustard, white wine vinegar, salt, and ground pepper. Instead of chives, I've used scallions. I've made a large bowl of this salad as the family loves creamy potato salads. And we really like this creamy delicious potato salad. We had an enjoyable and satisfying meal. Yums! My kids was asking when am I going to cook another of Ellie Krieger's recipes! Soon, very soon! Place the cornflakes in a food processor and process until crumble form (you should have about 1 cup of crumbs). Transfer to a shallow dish and mix in the paprika, garlic powder, salt, black pepper, and cayenne pepper. Preheat the oven to 350F. Spray a baking sheet with cooking spray. Remove the chicken from the buttermilk, shaking off excess buttermilk from the chicken. Discard the remaining buttermilk. Brush each piece of chicken with honey, then dip in the cornflake crumbs, pressing hard so the crumbs adhere to the chicken. Place the coated chicken on the prepared baking sheet. Lightly spray the top of each chicken thigh with cooking spray. Bake until the chicken is crisped and cooked through, 45 to 50 minutes. Place the potatoes in a steamer basket fitted over a large pot of boiling water. Cover and steam until the potatoes are knife-tender, 25 to 30 minutes. Remove from the steamer and allow to cool completely. Cut the potatoes into 1/2-inch cubes. Place the eggs in a medium pot, cover with water, and bring to a boil. Reduce the heat to medium low and simmer for 9 minutes. Drain and rinse the eggs under cold water, or refrigerate until cool enough to handle, and peel them. Discard 2 yolks and then coarsely chop the remaining eggs. In a large bowl, whisk together the yoghurt, mayonnaise, mustard, vinegar, salt, and black pepper. Add the eggs, potatoes, peas, and chives and gently fold until combined. Cover and refrigerate to allow the flavours to meld for at least 1 hour and up to overnight. Au Revoir Chef Pepin! (Until We Meet Again), we at I Heart Cooking Clubs (IHCC) are saying farewell to our featured chef for the last six months, Jacques Pepin. 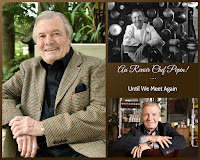 It has been a wonderful adventure cooking with Jacques Pepin recipes and will be seeing him again in one of our potluck weeks. The new featured chef for the next six months is Ellie Krieger. She is a certified dietitian and nutritionist with several books to her name, with delicious and healthy recipes. If you would like to join us, do drop by IHCC for more info. To bid "farewell" to Jacques Pepin, I've made his Garlic Soup. I do not cook creamy soup like this as often, and this sounds so French! haha! There's leek, garlic and potatoes, all my favourites. A quick and easy soup to make, yet it is so flavourful. Leek and whole peeled garlic are sauteed in some olive oil till soften, then the potatoes are added in along with some stock and salt to taste. As usual, I've added a few extra garlic. Boil gently for about 30 minutes until the potatoes are soft, then the mixture is pureed in a food mill, I've used an immersion blender which takes only a minute or so. Stir two tablespoons of butter through the hot soup and serve with croutons. To make the croutons, cube some white breads, heat some olive oil in a skillet and drop the bread cubes into the hot oil, turning them often until the bread cubes are brown and crispy. I garnished with some chopped chives from my garden pot. Lovely garlicky creamy soup! The potatoes makes a natural thickener and adds creaminess to the soup. A winner with my son and daughter. Delicious eaten with the croutons.